Sean Shibe was born in Edinburgh in 1992. He graduated from the Royal Conservatoire of Scotland in July 2012 with first-class honours, the youngest musician to have ever entered the establishment, and continues his studies with Paolo Pegoraro in Italy. Sean has been a trailblazer for his instrument: he is the first guitarist to be admitted to the prestigious BBC New Generation Artists Scheme, and the only solo guitarist to have received a Borletti-Buitoni Fellowship. 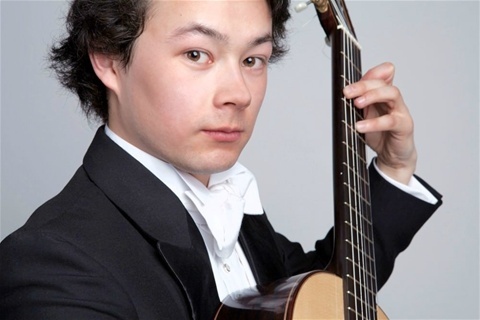 In May 2015 he was one of only three musicians to be admitted to the Young Classical Artist Trust (YCAT) out of 120 applicants for the year. In 2009 Sean won first prize in the Ivor Mairants Guitar Award of the Worshipful Company of Musicians and in 2011 he became only the second guitarist ever to win the Royal Over-Seas League first prize and gold medal following the competition final at the Queen Elizabeth Hall. Recent career highlights have included recording Takemitsu’s ‘To the Edge of Dream’ with the BBC National Orchestra of Wales, attending the Marlboro Summer Music Festival at the invitation of Mitsuko Uchida, performances in Italy and at Glasgow’s Big Guitar Weekend, and performing live on BBC Radio Three at Aldeburgh as part of the final weekend of the year-long Britten Centenary celebrations. Highlights of the coming season include his debut with the BBC Symphony Orchestra performing the Villa-Lobos Guitar Concerto, performing the Arnold Guitar Concerto with BBC National Orchestra of Wales, and a welcome return to Marlboro in Summer 2015.